Many apologies for forgetting to include a key ingredient (applesauce - DUH!) in my Apple Spice Bundt Cake recipe. I have now updated that recipe along with a picture. To make up for it, I am including the best recipe for cake ever! Sorry for not being more modest - I made this up and I can't believe how good it is. It is moist and fluffy. There isn't any oil in it but the 3 bananas more than make up for it. Jeff thinks I should enter it in a contest. One note - I used Dole Pineapple Orange Banana Juice only because I was too cheap to buy just banana nectar or juice. I think that would work swell in this recipe, too. Enough bragging and onto the recipe. Mix all ingredients together (I start with eggs and add ingredients one at a time). Spray your Bundt pan with a non-stick cooking spray. Add cake batter and bake for 45-55 minutes or until a toothpick inserted in the cake comes out clean. Start checking the cake after 30 minutes. Do not over bake. Cool cake in pan for 1 hour. Make glaze by whisking powdered sugar and juice together. Optionally, you could substitute 1 tablespoon of the juice with milk. Turn cake onto plate and drizzle glaze over the top. Eat it all with a side of milk. I think I'm going to need a bundt pan for my birthday or Christmas! Yumm!!! OK, I'm drooling again. Perfect dessert for October. I'm glad you included the recipe along with the yummy picture. 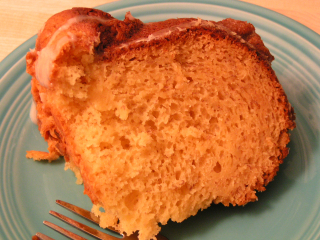 Thanks for the update on the Apple Spice Bundt Cake recipe. And this new one looks delicious, too. You're inspiring me to get busy in the kitchen.